12th or HS finished candidates must apply for the Tripura Agriculture Department Recruitment 2018 from 25th Sep to 6th Oct 2018 in the offline mode to get a good job. The necessary information of 50 Agri’ Assistant Vacancy in Tripura Agriculture Dept. are posted on this page and agri.tripura.gov.in page. Only eligibility known candidates post the agri.tripura.gov.in Agri Assistant Offline Application to the postal address. The correctly completed application form, if want to be considered then it has to reach the office address before the completion of 6th Oct 2018 day. One minute delay after the last date will affect your application form. 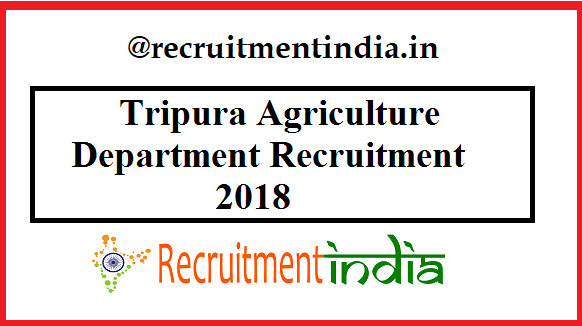 Job aspirants who have pursued the interest of joining the employment in the field of Agriculture, then they can once check out our page for the Tripura Agriculture Department Agri’ Assistant Recruitment 2018. For those willing candidates, the option to chose the employment in their interested field is given by the Tripura Government by means of this recruitment. Hence job seekers move to this page to get the full details of the Tripura Agriculture Department Recruitment 2018, then only apply for this Tripura State Government job. Before the verification of details, don’t get into the process of application. Only a few minutes will take to revise the details of the recruitment. Hence all candidates, without any carelessness view all the details from our page. Applicants with HS qualification can apply for the Tripura Agriculture Department Recruitment are the suitable candidates for these 50 Agri’ Assistant Vacancy in Tripura State only in view of the educational qualification. The educational criteria are the major criteria to be met by each and every applicant and this is the only one qualification that has no reservations or excuses. So candidates, don’t expect the reservations in this condition. For remaining criteria like age limit, application fees there is some exemption. Department of Agriculture and Farmers Welfare in Tripura state recruitment cell explains all this information to the candidates through the Tripura Agriculture Dept. Agriculture Assistant Recruitment notification. That notification can be obtained to the candidates in this Recruitmentindia.in post. Applicants should complete H.S. (+2 Stage) Passed with Science from recognized Board. For this Tripura Agriculture Department Vacancy, the selection process is mentioned in the Tripura Agriculture Department Recruitment Notification. Tripura Agriculture Department Agri’ Assistant salary is Rs. 14078/- per month. For all category applicants, the fees details are given in the Tripura Agriculture Department Recruitment 2018 notification. These Tripura Agricultural Assistant jobs are the suitable jobs for the candidates who qualified the 12th class. Higher qualification possessed candidates can also apply for this Tripura Agriculture Department Recruitment 2018. The one who is from Tripura State and having the conditions mentioned in the notification, those all can register their name for the selection process before the ending of 6th Oct 2018. Through the Tripura Agriculture Recruitment of Agri Assistant, nearly 50 candidates will be finalized by the end of the written exam, interview or certificate verification process. If you want to be in that final list, then prepare for the exam right from this moment by saving the syllabus copy. In the main page of Tripura Agriculture Department, the update of the Tripura Agriculture Department Recruitment 2018 is given. This update has been given in the form of official employment notification. Postulants, no need to search for the Tripura Agriculture Department Application Form separately as it has attached with the notification only. Sample form of the application form was uploaded at the below part of this page. Hence candidates Apply Offline 50 Agri’ Assistant in Tripura Agriculture @ agri.tripura.gov.in. If anyone tries to apply online, you cannot complete it because there is no that type of application filling allowed by the board. Earlier, taking the print out of the registration forms is started, so you also start the posting of filled form to the given postal address. Check the latest Employment News from our page.